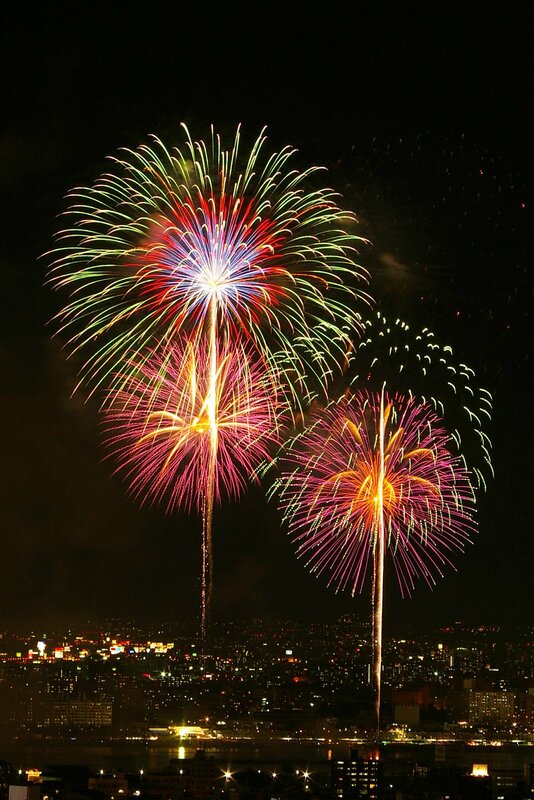 One of the biggest and most beloved fireworks festivals in Osaka, the Naniwa Yodogawa Fireworks Festival (なにわ淀川花火大会) has been held along the Shin-Yodogawa River every year since 1989, and despite its size, the festival is put on almost entirely by the local residents and businesses of the Juso neighborhood. Attendance each year is approximately 500,000 people, and the fireworks display is massive. The 2010 festival will be held on Saturday, August 7: the fireworks start launching at 7:50 pm and the show lasts until around 9:00 pm, but unless you have a reserved seat somewhere, I suggest bringing your tarp and staking out a place along the river in the afternoon if you want any chance of sitting. Most people dress up in yukata and have picnics beforehand, making it an all-day event. The closest stations to the festival are Tsukamoto Station (JR Kobe/San’yo Line) and Juso Station (Hankyu Kobe, Kyoto and Takarazuka Lines). Admission is free unless you want reserved seats. The festival’s homepage (Japanese only) can be viewed here. Note: Photo by Wikimedia Commons. Osaka Castle was built originally by Toyotomi Hideyoshi, Japan’s revolutionary leader in the late 16th century who rose from peasantry to become one of the three unifiers of Japan and put an end to a long, bloody period of feudal warfare. Completed in 1597, the castle was the largest, most intimidating castle in Japan at the time, and it overlooked and provided the catalyst for the rapid growth of Osaka, which would become the “merchant’s capital” and economic engine of Japan during the Edo Period (1600-1868). Hideyoshi’s son, Hideyori, would resist the forces of the shogun Tokugawa Ieyasu, who took power after Hideyoshi’s death. Hideyori would defend against two assaults using Osaka Castle as a base before committing suicide with his mother when the battle was lost. Hideyoshi’s castle was destroyed after the battle, and the rebuilt version once again during a fire; the current structure is a faithful reconstruction (except for use of concrete) from the 1930s, renovated in 1997 to express the feel of original more closely. The moats and walls are almost all original, and one of the turrets is also an original. The inside of the castle has been turned into an in informative and interesting history museum, and the view from the top of the keep provides a great way to see the whole city. Osaka Castle Park is lovely, especially when the cherry blossoms are blooming, when the plum blossoms are blooming, and when the autumn leaves are changing. You can also see Hokoku Shrine, one of the many temples built to honor Hideyoshi, within the park grounds. While some criticize Osaka Castle because it is a re-creation, I would argue, without getting into a deep discussion about the true significance of historical monuments, that it is still fulfills the roles it was primarily intended to play–namely, that of impressing visitors and of acting as a symbol of Osaka. Some scoff at the elevator attached to provide access to the entrance, but from my perspective, it provides an equal chance for all people, no matter their physical condition or health, to visit this important site. In summary, Osaka Castle is a must-see for any visitor to the city, and its park (one of the most beautiful and well-planned around), its event facilities and its sightseeing boat dock pier make this one of the most important sightseeing spots in the city. Access: Directly outside Morinomiya (Chuo and Nagahori Tsurumi-ryokuchi Subway Lines, JR Loop Line), 5 min. walk from Tanimachi 4-chome Station (Tanimachi and Chuo Subway Lines), 5 min. walk from Tenmabashi Station (Tanimachi Subway Line, Keihan Subway Line), 10 min. walk from Osakajo-kitazume Station (JR Tozai Line), 10-15 min. walk from Kyobashi Station (JR Loop Line, JR Tozai Line, JR Gakkentoshi Line/Katamachi Line, Keihan Lines, Nagahori Tsurumi-ryokuchi Subway Line), 5 min. walk from Osaka Business Park Station (Nagahori Tsurumi-ryokuchi Subway Line), or 5 min. walk from Osakajo-koen Station (JR Osaka Loop Line). Many of the Aqua Bus sightseeing boats stop at the park, also. A PDF version of the map in English, which includes many of the stations mentioned, is available here. Costs: Osaka Castle Museum costs 600 yen per adult, and is free for guests 15 years of age or younger. There are also group discounts. Entrance to the park is free. Hours: Osaka Castle, which has a museum and an open-air observatory from the top, is open 9 am to 5 pm (closed from Dec. 28 to Jan.), and guests are admitted until 30 min. before closing time. The park is open at all times. Castle facilities are open until 7 pm during the summer (July 17 to Aug. 29). For more information about the museum, call 06-6941-3044. Also check out Osaka Castle’s website. Last weekend was the big one for cherry blossom viewing (hanami) in Osaka, but in case you missed it, grab your picnic gear because there is still time left. I mentioned the cherry blossoms of the Mint building and Osaka Castle Park in a recent post; this time I will list a few more scenic places in Osaka to go for hanami. Shitennoji Temple: The grounds of this beautiful old temple complex, rich with the culture of Osaka past and present, is a lovely way to take in the sights of spring. Shittenoji is located just a few minutes on foot from Shittenoji-mae Yuhigaoka Station (Tanimachi Subway Line). Kema Sakuranomiya Park: This park, located to the northeast of Tenmabashi and the northwest of Kyobashi, stretches along the Okawa River. Beautiful under ordinary circumstances, the scenery here is fantastic at this time of year with fluffy pink and white flowers reflecting off blue waters. You can get here most easily from Sakuranomiya Station (JR Osaka Loop Line). Banpaku Kinen Koen (Expo Commemoration Park): This is one of the best sites in Osaka thanks to its superb facilities, beautiful natural scenery and imposing Tower of the Sun. It’s even better during cherry blossom season. Located in Suita, this park can be reached via the Osaka Monorail (get off at Banpaku-kinen-koen Station). Daisen Park: Here you can take in cherry blossoms in Sakai, surrounded by the ancient tombs of emperors past. The Sakai City Museum is located just steps away, in case you are interested in learning about the local history. Daisen Park is only a short walk from Mozu Station on the JR Hanwa Line. For information on other parts of Japan, check out japan-guide.com’s cherry blossom forecast! Amidst moans and groans about rainy spring weather, talk about budding flowers is increasing day by day. This can only mean one thing: cherry blossom season is almost here! As many of you probably know, one of the biggest seasonal activities of the year is hanami: a chance to have a picnic outside after a long winter, surrounded by fragrant pink and white flowers. Sure, you have to fight stifling crowds, put up with pushy obaasan jabbing you with umbrellas, and patiently wait for some guy with a fancy camera while he takes 20 minutes to snap a picture of a single flower. But in the end, the cherry blossoms of Japan are so beautiful, it’s worth it every single year. The Osaka Mint Building is the best place to see cherry blossoms in Osaka City. Since the 19th century, the Mint has a tradition of opening its garden to the public for one week a year when its cherry blossoms are in full bloom. There are about 350 trees of 120 varieties, and they are even illuminated during the evening to create a romantic feel. The 2010 event will be from April 14 to April 20, open from 10 am to 9 pm on weekdays and 9 am to 9 pm on weekends. This is the best place to see cherry blossoms in Osaka. If it’s picnicking you’re after, you can hop over to nearby Osaka Castle Park. The cherry trees here are also gorgeous, and if you look around for a while, you will most likely be able to find a patch of grass or dirt to lay your blanket out on (I highly recommend an early arrival to stake out a spot if you are serious about picnicking here). Trees may come into full bloom here a little earlier than at the Mint Building, although the periods will most likely overlap to some extent. The best way to get to either location is by walking from Tenmabashi Station. There are also a number of cruises operating along the flower-lined Okawa River at this time of year from Hakkenyahama Pier, located just behind the station on the riverfront. General cherry blossom info for Japan can be found (in English) at Japan-Guide’s Cherry Blossom Forecast 2010. According to them, the best time for hanami this year will be late March and early April. You can also see live updates of the “cherry blossom front” every day by watching weather reports on TV. Access: Both the Osaka Mint Building and Osaka Castle Park are a short walk from Tenmabashi Station (Keihan Lines and Tanimachi Subway Line). The Mint can be reached by crossing the river (follow the signs and crowds), and the castle can be reached by heading in the general direction of Osaka Business Park (OBP). Click here for more information in Japanese. Amidst moans and groans about rainy spring weather, talk about budding flowers is flying about more and more every day. This can only mean one thing: cherry blossom season is almost here! As many of you probably know, one of the biggest seasonal events of the year is hanami: a chance to have a picnic outside after a long winter, surrounded by fluffy pink and white flowers giving off a perfume-like fragrance. Sure, you have to fight stifling crowds, put up with pushy obaasan jabbing you in the back with umbrellas, and patiently wait for some guy with a 300,000 yen camera while he takes 20 minutes to snap a picture of a single flower. But in the end, the cherry blossoms of Japan are so beautiful, it’s worth it every single year. The Osaka Mint Building is the best place to see cherry blossoms. Since the 19th century, the Mint has a tradition of opening its garden to the public for one week a year when its cherry blossoms are in full bloom. There are about 350 trees of 120 varieties, and they are even illuminated during the evening to create a romantic feel. The 2010 event will be from April 14 to April 20, open from 10 am to 9 pm on weekdays and 9 am to 9 pm on weekends. This is the best place to see cherry blossoms in Osaka.